Betrayal is paying of for some of the "Survivor" contestants, ousted tribemate Tijuana Bradley tells The Early Show. 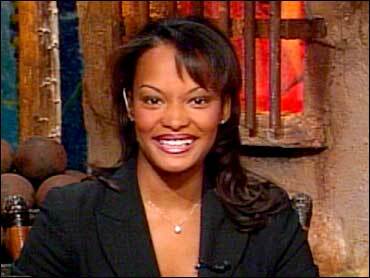 Sandra convinced Tijuana that Burton and Jon had formed an alliance against the others, and she worked to convince the other "Survivor" contestants to vote out Burton at Tribal Council. Unfortunately for Tijuana, Jon's slippery tactics won Christa and Sandra over, and when it came time to vote, they banded together and sent her home. Talking about Sandra, Tijuana says, "She did approach me and said, 'Hey, listen to this.' And I listened and found out myself and Darrah would be the next to go and I wasn't going to have that. So, instead, we decided with the girls that we would stick together and take Burton down. But Jon, behind my back, lied to Christa. He said I hated her and I wanted her gone. As a result, I was the next person out." A man with no ethics and absolutely obnoxious is how Tijuana describes Jon. So why is he still playing the game? "I still don't know," she says. "I think at the time, he just sounded so convincing and especially for Christa and Sandra. They thought what he was seeing would get them gold and, as a result, we paid the price. I tell you what, every week as his character unfolds, he becomes more and more despicable." On Thursday's episode, Jon pulled a "fake dead grandma" scam, committing the single worst act of deception in Survivor history. Tijuana says, "I'm pissed off about that, too, just because I supported him. He lost his grandmother. I know how hard it is to lose a family member. Let's support him and stick together and forget the game. It's morally and ethically human and he played us." John lied at a pirate-themed reward challenge in which the Survivors were reunited with one loved one each for a question-and-answer quiz game designed to reveal just how well they knew each other. The winner's reward was to have their loved one spend the night at camp, while the remaining castaways were banished to a new deserted island. Jon's friend shared the news that his grandmother had died. Jon, all grief and tears, easily gained the sympathy of his fellow tribe mates, and they agreed to toss the reward challenge his way, enabling his friend "Thunder D" to stay the night and share news of his grandmother. But as soon as Jon and Thunder D were alone, they broke out the high fives and evil chuckles at having duped the rest of the contestants. Jon proved once again he'll do anything to beat the game. Tijuana did not know about his plot until it was revealed on Thursday's episode, but she says she had her suspicions. "When I heard in different interviews that something was going on about who would lie, I knew Jon would be the big liar but at the same time, I didn't know what it was. So I was blown away," she says. The person she says she has gained respect for is Sandra. Though Tijuana says it didn't start that way, "She didn't do too much work on the island and it was kind of frustrating, but, at the same time, now looking at the game, I have a great respect for her. She's playing the game big-time." As for Burton and Lil being back in the game, Tijuana says it is a twist she does not agree with. She says, "I respect CBS and the fact of bringing back a new change of the game but as far as the concept, I hate it because they have an up on us. They had time to think what they would do different. I wish I could do things differently."